We are so very blessed to have Alice in our family. She has spent her first four years sharing her happy zest for life with us and bringing us all so much joy. 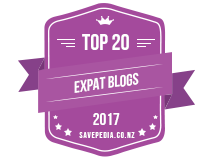 There’s been no need to rush her off to kindergarten when we were in New Zealand, or a preschool whilst here in California, as she’s always had plenty of activity in the home with her sisters, neighbourhood friends and family. She’s a chatty, friendly, sociable girl who has sooooo much love to share. 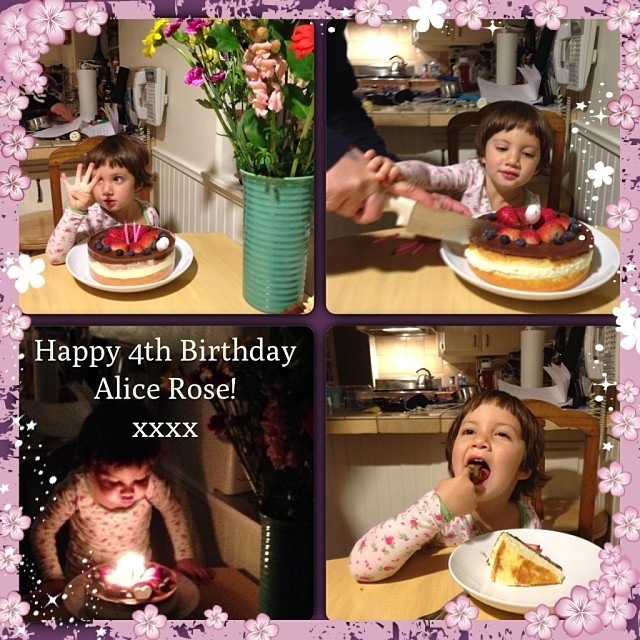 We enjoyed a fabulous day of fourth Birthday celebrations with her over the weekend; from a morning of present opening and playing, to an afternoon of splashing in the swimming pool, running on the beach and finishing up with Birthday cake. Nothing was planned, everything just flowed. 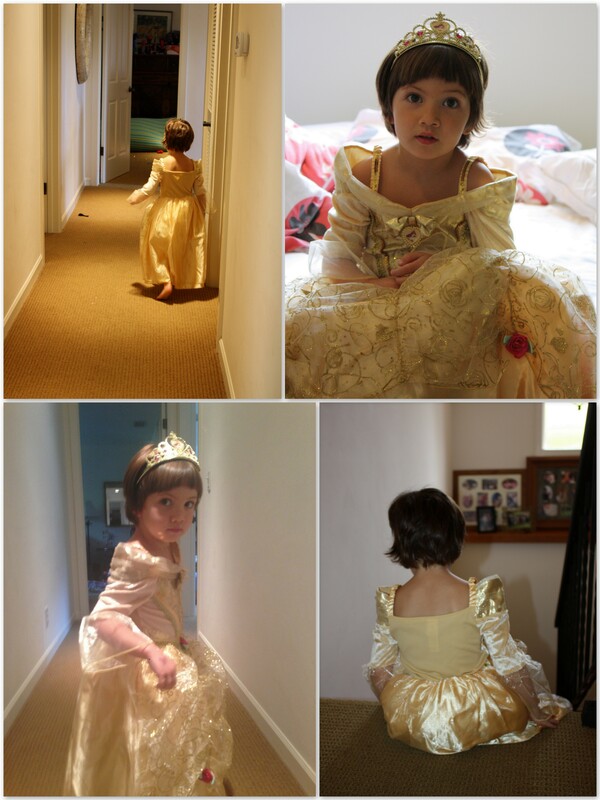 She loved her special day and kept asking, again and again, ‘Am I really four now?’. She kept checking to see if anything about herself had changed, along with her age. She thought that she’d be a different size or have to sleep in a different bed. I recall her older sisters asking similar questions around this age. She was almost a little worried about turning four, saying, ‘I’m happy being three, but I do like Birthdays!’. 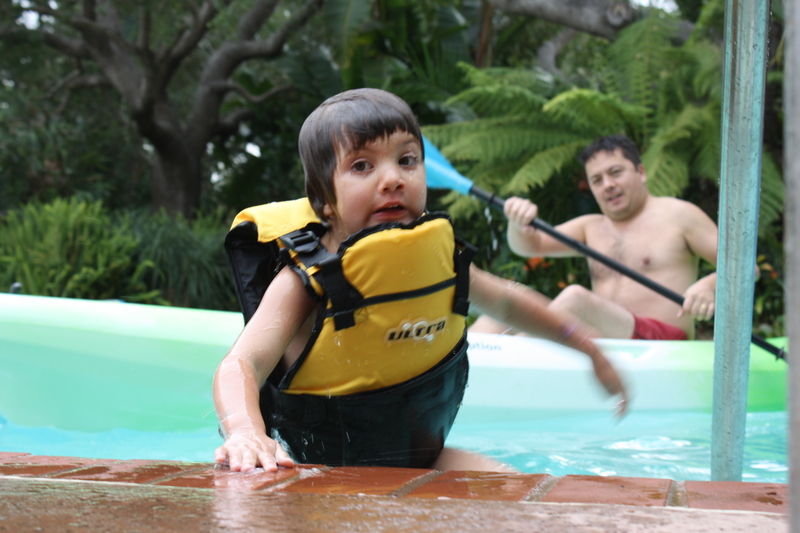 It was hilarious when the man of the house got the kayak in the swimming pool and she togged up in a life-jacket for a ‘high sea adventure’! She loves the water and her biggest accomplishment this year has been learning to swim. Her energy throughout the day was wonderful and she just about managed to stay awake for some Birthday cake, after meeting me on the beach, after my jog, for a little workout of her own! We drove back home, with the top open on the VW, to keep her awake. She crashed pretty soon after blowing out her candles and devouring the icing off her Birthday cake! Her good friend here, Ollie, couldn’t make her actual Birthday – but we are looking forward to a bit of party fun, pirate style, this coming weekend with him! Miss 4 lives in a world of imagination and creativity. 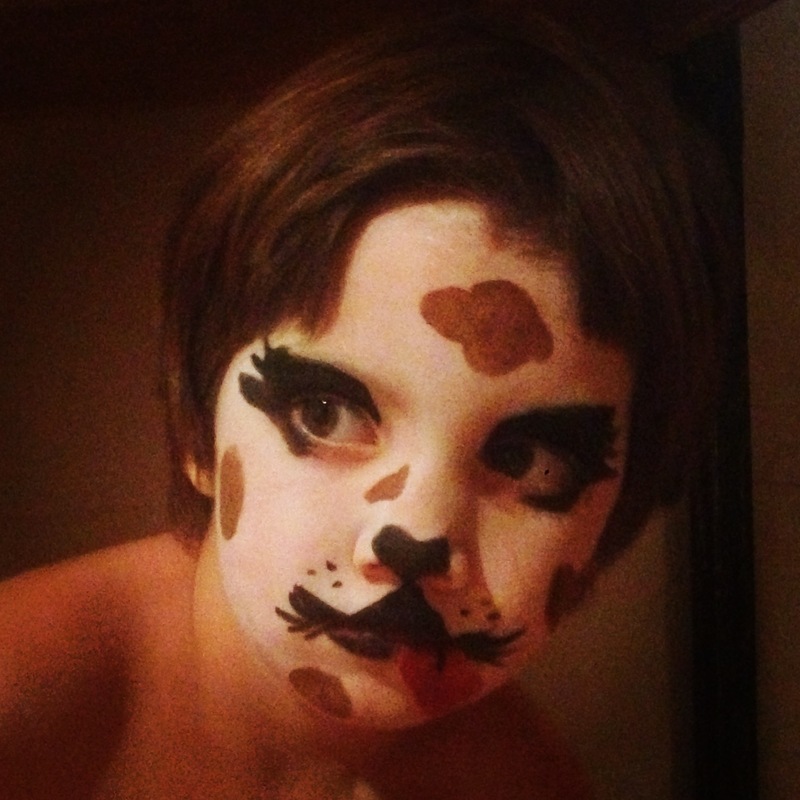 Face paint is frequently requested and she asked me to turn her into a puppy dog the other day – to surprise her Daddy on his return from a three day business trip away (she wanted to ‘pretend’ she was a new pet in the house). She plays with her toys in such creative, imaginary ways, making up stories with her dolls, or dinosaurs, cars, trains… she’ll pick up sticks, leaves and acorns for various props, anything to hand makes a story really! Life in action - Videos, Special Days, Things I'm Loving Birthday, Birthday cake, celebration, featured, sisters. permalink.